Ancient Koshas: Dictionary or kosha, as a rule, is a store house of words in general specifying their applicable meanings and genders. 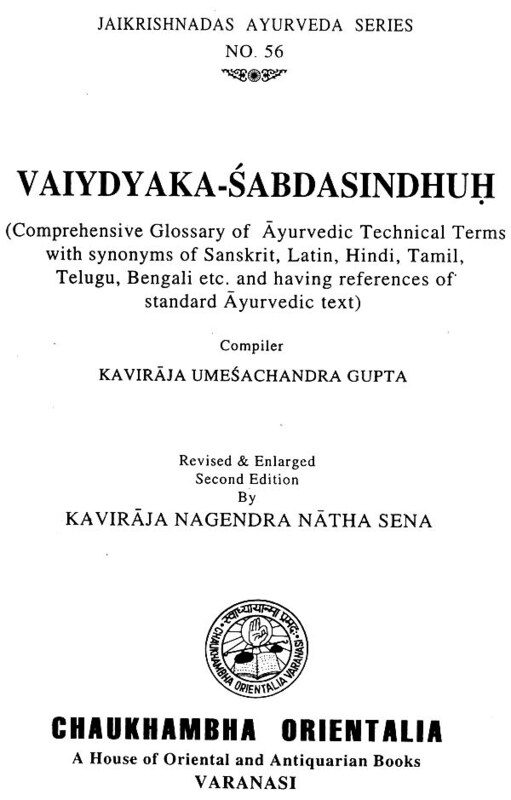 Almost all the old koshas or Sanskrit Dictionaries hitherto published have been composed in verse and divided into Vargas or groups and classified under different arrangement, such as Amarakosha, Hemachandrakosha &c.
Dravyabhidhana Nighantu, Dravyagunabhidhana and Paribhasha &c. are Ayurvedic Medical Dictionaries. 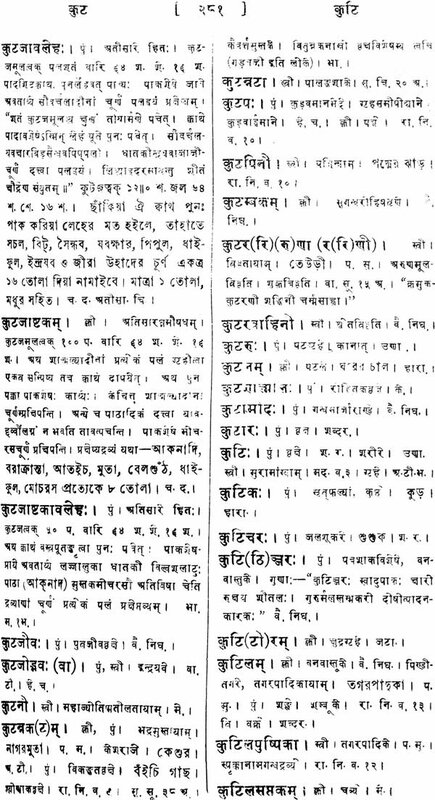 There are many of these Dictionaries, but all of them are entirely devoted to the description of synonyms, properties, tastes, irritating and cooling ualities and vipaka or result of assimilation of individual medical drugs, minerals, animals and vegetables, Such works are composed in verse with explanations of drugs and other substances in different languages, viz - Bengali, Hindi, Maharashtra &c. Works under the name of Dravyabhidhana, such as Ratnarnala, contain only lists of medical drugs, minerals, animals &c. Whilst works included under Dravyagunabhidhana, such as Rajaballobhtya Dravyaguna, S abdachandrika &c. explain the names of medicinl substances with their properties, tastes &c. Paribhasha is a treatise on medical technical terms, and general descriptions of Phanta, Kashaya &c. They are Paribhashapradtpa and others. The words contained in Sanskrit Dictionaries, innumerable as they are, are of seven kinds, so far as their oonstruction and derivation are concerned. Drugs used in medical sciences have their nomenclature in three different ways – (1) Some are known everywhere by one and the same name, (2) some by names used in hilly tracts of countries where they grow, and (3) others by different names given to them in different countries. The names of material objects are explained in different languages in different dictionaries, so as to render them intelligible to students conversant with any particular language. If however attempts were made to explain the words of material objects in one particular dialect, the result would be to make the vocabulary useless to those unacquainted with that language and thwart the very object of the compilation. It is, for this reason, absolutely necessary, that the names of medicinal drugs and other equally important substances should be explained in two or three well-known current languages. There are some material drugs grown in hilly tracts mentioned in the Koshas which are never to be seen in the plains, and consequently the physicians know of their names and properties only in words. These substances being scarcely found now a days their discoverers have wisely suggested adequate substitutes. The ancient mode of teaching was to make the pupils get the Kosha by heart as being indispensably necessary for the purpose of studying science in general and the medical science in Particular. This process was of course resorted to by the few who happened to be gifted with retentive memory, but to others whose number was far more numerous, it presented an insuperable barrier in the way of their medical study and not unoften dissuaded them altogether from such a pursuit. It cannot, however, be denied that, this process of training’ proved eminently advantageous to the few medical students who achieved success and began life as the reliever of human sufferings. The boundless fields of material objects, some nectar like, others possessing deleterious properties, some. comprising our food affording, nourish- ment both to our body and’ brain and some possessing healing and cooling properties, whilst others having killin properties. All these formed the exclusive subject of researches of thy ancient RishisBharadvaja, A’treya, Agnives’a and others. These Rishis after having ascertained the different properties of different drugs, had them procured through the hermits and others who used to spend their lives in the wilder. With their wonted zeal and perseverance they carefully verified their efficacious qualities as affecting human system and introduced them in the medical science. They therefore firmly believed that, a thorough knowledge of these drugs formed the most important factor in the attainment of success in medical treatment, and the-only way to utilise them as the means of reference’ was to get their accumulated treasures of experience by heart. They were therefore of opinion that, before commencing his practice the medical student must get Dravyabhidhana by heart, as the students of the Calcutta Medical College do pathology ; for without a complete knowledge of the drugs both theoretical and practical, the very object of medical treatment would be defeated. Thus the idea to get all the above mentioned ancient medical books by heart and to retain them in memory throughout lifetime without losing a single link of the entire. Chain, is positively impracticable and decidedly discouraging to many who may be inclined to study the Hindu medical science. To compile therefore a dictionary of the description just given is indeed a hopeless task. To collect and collate words from different printed books and MSS of this country, the latter replete with the blunders of copyists, is a task as arduous as it is discouraging. Sometimes it becomes even hopeless to ascertain the real reading even by consultation with learned physicians. When such difficulties presented themselves in my way, all my endeavors to surmount them with the assistance of others proved fruitless. It will thus be easy to imagine how very difficult it must be for one of my moderate ability to undertake a task hitherto unattempted by the best Pandits of the country. No one but those who have employed themselves in similar labours can at all realize the amount of tedious toil involved in the compilation of such a work. Indeed the prospect of success began to appear to me more and more gloomy, as I slowly pressed onward. The error and imperfections with which the compilation must abound even if it were destined to be completed, became more and more manifest, and my attempt to complete the work would have been nipped in the bud but for the encouragement I received by the example of old writers on the subject. It is necessary to add that, in my alphabetical arrangements I. have followed the method adopted in the S’abdakalpadruma and as a mark of my respect to the learned Pandits of my country I have assigned to a separate space at the end. For fear of unnecessarily increasing the bulk of the dictionary I have not followed the plan of S’abdakalpadruma in giving all the synonyms together. I have, however, given the most selected medical terms with their medical meanings which are quite enough for my present purpose. Where a word conveys various meanings, I have endeavourer to show them, as far as practicable, in their respective places. In the description of qualities and medicinal virtues of different drugs, the Rishis of different periods have held different opinions. In such cases, I have taken only two or three authorities generally accepted and avoided mentioning others whose opinions are either obsolete or not well grounded and consequently unnecessary for my present purpose. I have also attached at the beginning of the work a list of abbreviations of words required for reference. 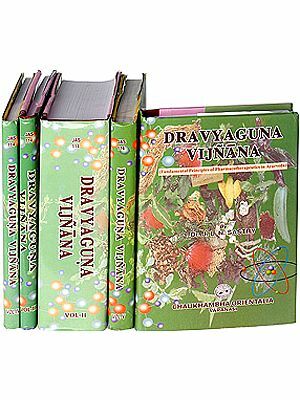 Pathology of diseases and the process of preparation of efficacious medicinal Oils, Ghritas and compound medicines have been added by the special desire of the Maharaja of Vizianagram. 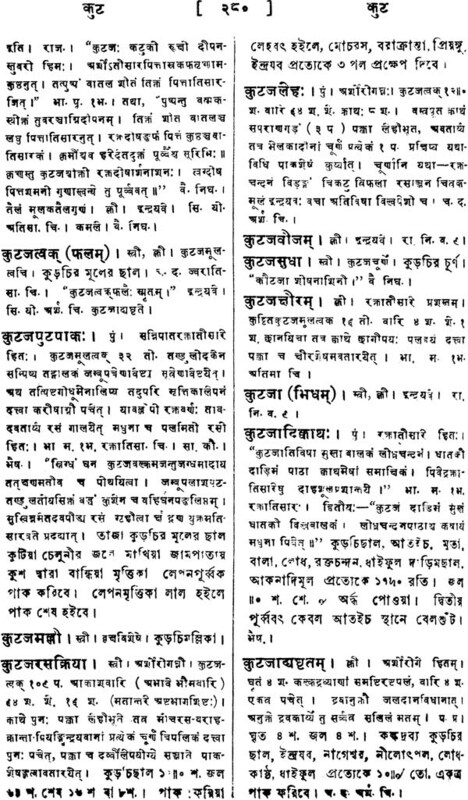 In order to render the names of drugs intelligible to the people of different countries, I have given their meanings and explanations in the following Languages, VIZ, Latin, Bengali, Hindi, Maharashtra, Telegu, Karnatic &c. The Latin synonyms have been taken from Watt’s Economic Products of India. Udayachand Datta’s Materia Medica, Professor Wilson’s Sanskrit-English Dictionary and Professor Monier Williams’ Sanskrit-English Dictionary. Hindi and other synonym have been collected from Bhavaprakas’a, Rajanighantu, Madanapalanighantu, Dhanvantarinighantu &c. For Telegu terms I am indebted to Babu Radhanath Biswas, at whose request the Pandits of the court of His Highness the Maharaja of Vizianagram have rendered me all the assistance I needed. 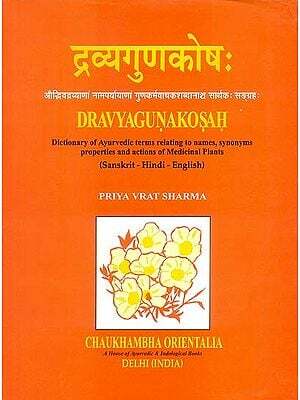 Charakasamhita a treatise on Kayachikitsa or treatment 0 general diseases, is generally considered to be older than the Susruta samhita, and it is the first medical work of the A’treya school. The origin and dissemination of this wonderful work are ascribed to the sage Bharadvaja. At the close of Satyayuga when diseases began to make their appearance to an alarming extent, Bharadvajamuni, as President of the great council of Rishis, brought down Ayurveda, a part of Yajurveda, from heaven and gave instructions to his pupil Krishnatreya. Agnives’a, one of the six pupils of Krishnatreya in common with his other fellow students, wrote a treatise on Kayachikitsa in accordance with his instructions, which being found to be the best was published in the name of writer and styled “Agni vesatantra. “ This work was subsequently reedited and enlarged with elaborate explanations by Charakacharyya and published in his own name as “Charakasamhita. “ He divided into eight Sthanas or books, such as Sutrasthana, Nldanasthana &c. The whole work contains one hundred and twenty chapters. It is mentioned at the end of the Charakasamhita, that Dridhabalamuni of the Punjab completed the book by adding seventeen chapters to Siddhi and Kalpasthanas.